Christmas Sugar Cookies are classic dessert. 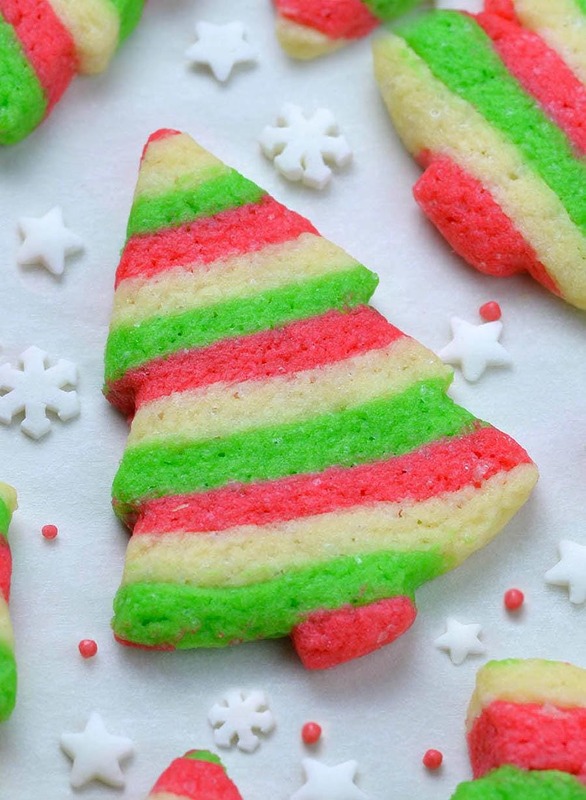 But, these cute, red, white and green striped Christmas tree cookies will make your holiday season merry and bright!!! Also, you should check these Star Gingerbread Cookies and stripped Christmas Cheesecake, if you are making plans for Christmas baking! However, some things just don’t change! Sugar cookies are popular for decades!!! Whether, they are rolled out and cut in different shapes, or formed by hand. Buttery cookies are favorite treat for generations! Also, we seen them frosted, sprinkled with colored sugar, decorated with icing…But, these adorable striped Christmas Trees, swept me of my feet. When I found Striped Sugar Cookies recipe at Cooking Chanel I was totally fascinated. Imediately, I knew that I had to try to make them, too. That pretty, striped sugar cookies are made by Zoë François from Zoe Bakes . 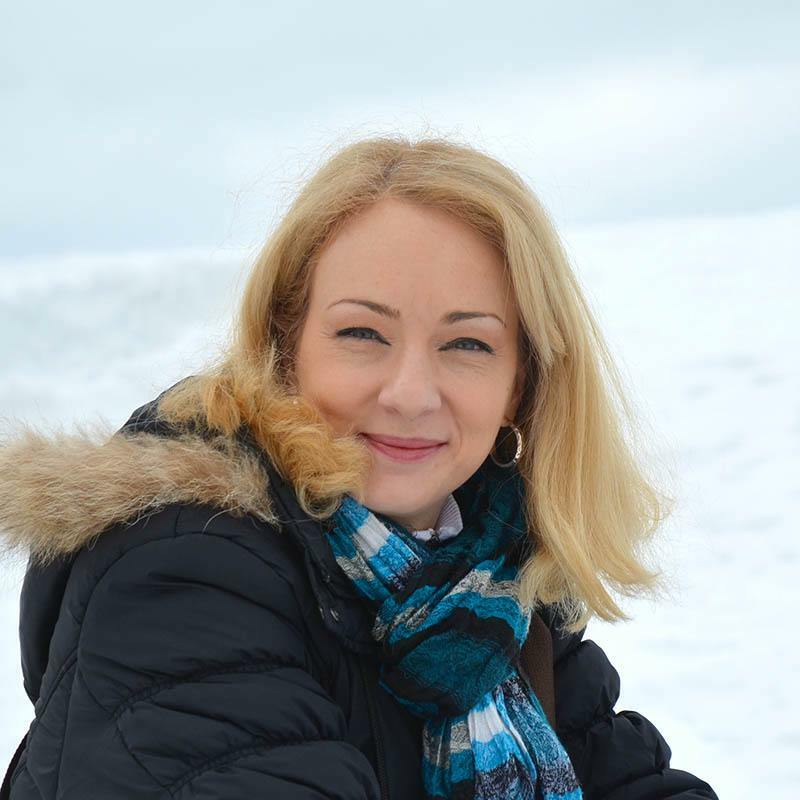 You must visit her blog and check other awesome recipes!!! At first, I thought that I won’t succeed and the only thing I would make is just a big mess. The recipe seems so complicated, but it’s totally opposite. 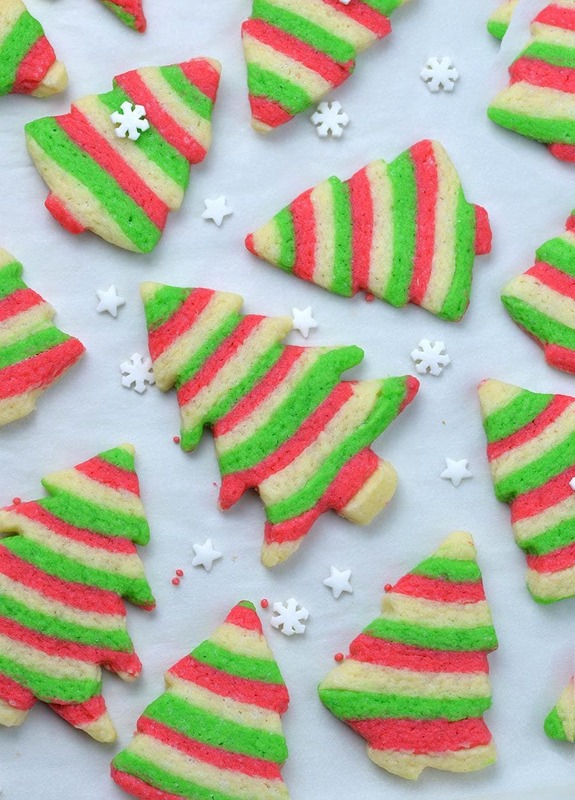 Actually, making these striped Christmas Sugar Cookies is pretty easy. This is just a classic sugar cookie recipe with simple ingredients (flour, sugar, butter, egg and baking powder). And that buttery classic makes delicious cookies every time. But for these festive Christmas Sugar Cookies, you’ll need to divide batter and color in red and green. Then, you should roll out the batter very thin, cut a rectangles and layer in a plastic container. After the dough has chilled, you should slice it and finally, cut out the shapes you like. This time I chose shape of a Christmas tree. Finally, these Christmas Sugar Cookies are perfect holiday treat. Sugar cookies is something everybody bake for Christmas. But these cute Christmas trees in traditional Christmas colors (red, white and green) is really fun and festive treat that everyone would rave about it. Need more Christmas Tree shaped dessert?! Then, check these Reese’s Peanut Butter Christmas Trees and Christmas Tree Oreo Truffles. First whisk together dry ingredients: flour, baking powder and salt, set aside. Then in a large bowl beat the butter and sugar until light and smooth. Scrape down the sides and bottom of the bowl as needed. Add the egg, vanilla, and almond extract and beat on high until fully combine. Now turn the mixer on low and add about flour mixture and beat to combine. At this point if the dough still seems too soft, you can add a tablespoon of flour until it is a consistency for rolling. Divide the dough into 3 equal parts. Reserve one part in white colors. Then add food coloring (red and green) in remaining batters. Line a container with plastic wrap. The container should be tall as the cookie cutter you’ll use and have enough volume for all layers of the dough. I used 4 x 5 x 3″ container. Now, prepare 3 large sheets of parchment paper. Roll each portion of dough out onto a piece of parchment to about 1/8″ thickness. Measure out the bottom surface of your container and cut the rectangles of the dough. 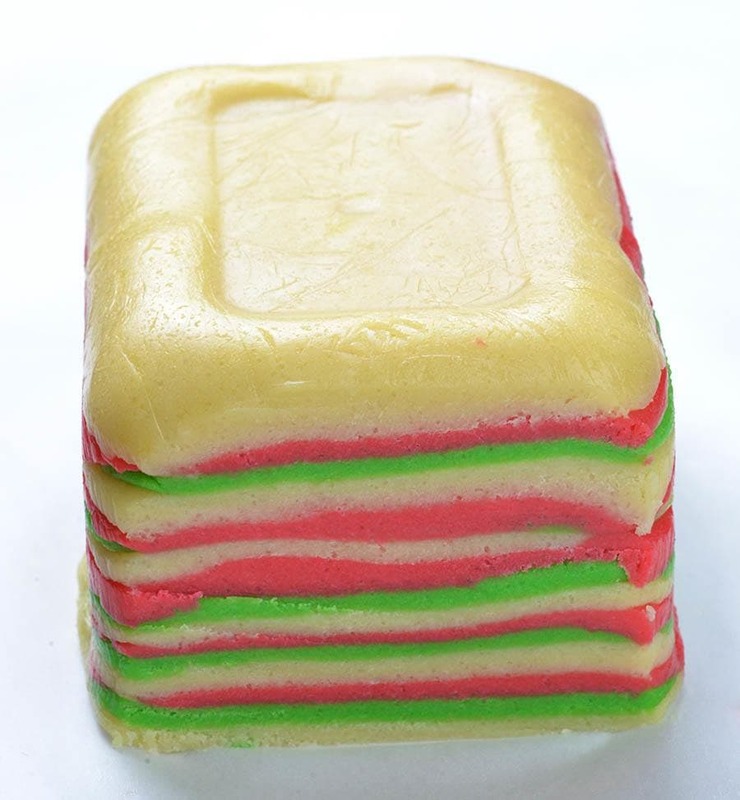 Stack the rectangles of the dough (red, white, green) in the container, gently press with your hands to stick the layers, cover and refrigerate until firmed enough for slicing (at least 3-4 hours or overnight). Chilling is mandatory! When the dough has firmed completely, preheat the oven to 350 F and line cookies sheets with parchment paper. Remove the dough from a container and using a large sharp knife slice thin and even slices about 1/6 or 1/8 thick and arrange them onto large sheet of parchment paper lightly dusted with flour. If the dough is falling apart along the stripes, then gently press them with your finger to come back together. Do not slice all the dough at once because it will become sticky at room temperature. Slice just as much as you need for one batch of cookies, and store remaining in the fridge until ready to cut and bake. Now, use a cookie cutter and cut in shapes, then transfer the cut cookie dough to the prepared baking sheet. 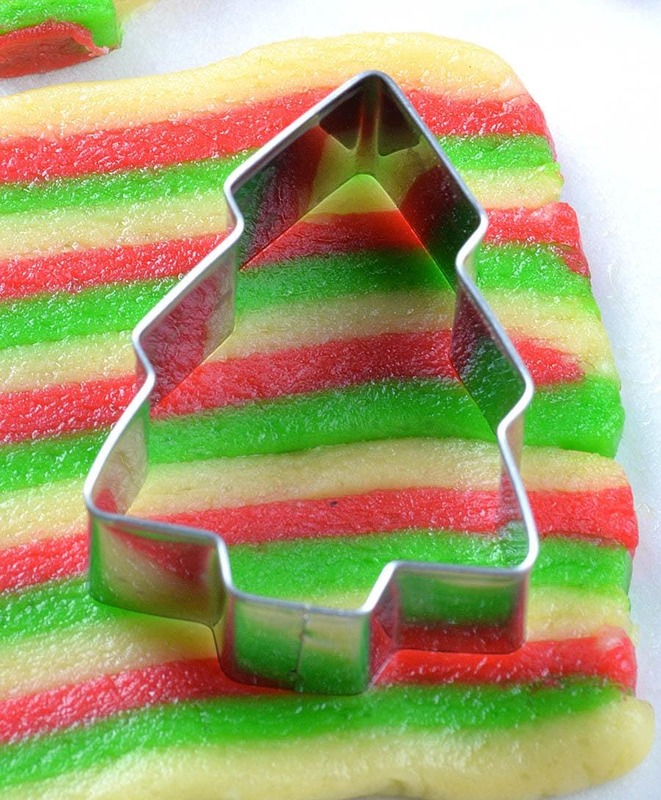 Use a large cookie cutter to make the cookies and with the small. cutter cut out the dough around the large shape, to make as little waste as possible. Also, you could pick the leftovers, arrange them to each other, stick with your finger and cut a few more cookies. Bake for 7-10 minutes (depending on size of your cookies) or until just barely golden on the bottom. Cool for 5 minutes on the baking sheet, then transfer on a rack to cool completely. Recipe adapted from Zoë François at Cooking Chanel ! The recipe says sugar but the instructions say powdered sugar, which is it? Hi, it’s sugar, not powdered sugar, thanks for noticed that, I’ve just corrected. What can you do with the leftover dough? Ordinarily I would re-roll it, but I suspect this would mix into an unappealing color. Hi Lori, you could pick up the leftovers, arrange them to each other, stick with your finger and cut a few more small cookies. Ingredient list says baking powder, instructions say baking soda. HI Theresa, it’s baking powder. Thanks for noticed that, I’ve just corrected it. Happy baking! instructions say batter and later say dough. there is a difference between batter and dough. please differentiate. shapes is to time consuming, I tried it. It makes about 60 small or 30 large cookies. Darling cookies, Texture is like heavy clay, TASTELESS ROCKS. Not over-baked, complete waste of time. Cute factor got me. Wish I hadn’t wasted my time or ingredients making these. Live & learn – won’t make the same mistake again. I don’t know what I’m doing wrong. I have tried this recipe 4 times. My dough looks nothing like the video. It’s very corse, crumbly and hard to work with. Can anyone give me any tips? Could it be too much flour?